According to the ATO Staff, yesterday at about 12:30 Ukrainian border guard units came under fire in course of a provocative small arms attack conducted from the territory of the Russian Federation. “The fire came from Ushakovka of Rostov region. Ukrainian troops incurred no losses and did not return fire,” reported Ukrainian Ministry of Defense spokesman on ATO Colonel Dmytro Hutsulyak at a press briefing at Ukraine Crisis Media Center. Over the last day Russia-backed militants demonstrated a low level of activityin the combat zone: they made a total of four attacks using 120-mm and 82-mm mortars at times. All the attacks took place in Donetsk sector. Russian proxies fired twelve 120-mm mortar rounds at Ukrainian positions near Shyrokyne. Militants also attacked Ukrainian troops’ positions near Vodiane and Pisky with 82-mm mortars and grenade launchers having fired a total of nine mortar rounds. Ukrainian troops did not return fire. 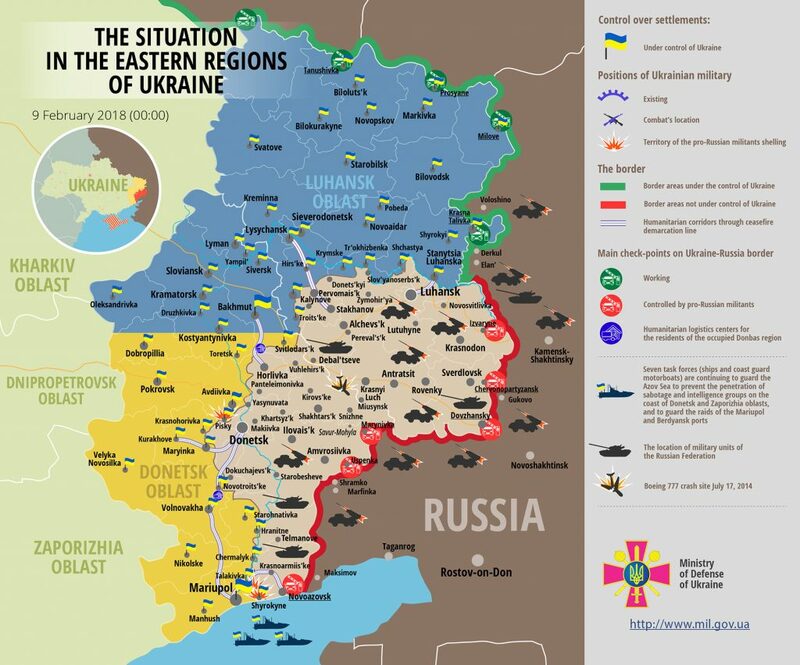 Unfortunately, one Ukrainian serviceman was wounded in action yesterday. Report on the military developments as of February 8 is available here. Interactive data on the shelling: chronology shelling chart and the interactive map.